Imagine the smell of fresh baked bread. Sounds of chopping. The inviting smells of parsley, coriander and lemon. Steaming tagines directly off the fire. 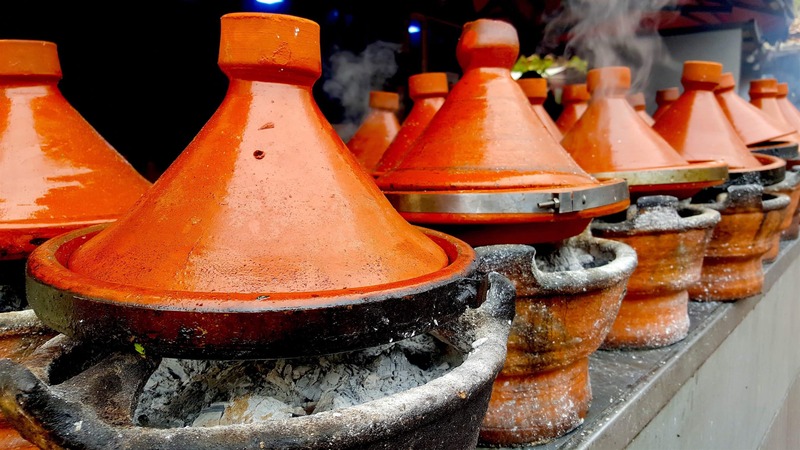 These vibrant senses are fabulous and inviting in this wonderful day trip to learn the basics of a Moroccan masterpiece: cooking. It is a wheelchair friendly excursion that is an ideal distance from the busy Djemaa el Fna square. Set in a beautiful riad with a traditional open ceiling, the cooking school provides a full day culinary experience beginning with a tour of the souks where fresh produce is purchased. From fresh baked bread – still warm from the oven – plentiful olives, and traditional Moroccan delicacies – this excursion is not to be missed! Everyone will be busy at chopping, tasting, chatting and following the creative sign language instructions from Moroccan ladies, the expert cooks. Culturally inviting and your taste buds will certainly thank you! This experience is partially accessible. Once inside the riad there are two small steps into a courtyard where the cooking takes place. Tables are taller than would be appropriate for most wheelchair users but if requested, the owner has communicated a willingness to provide lower tables. The bathroom is a significant barrier. Located in a side room off the main corridor there is a large threshold separating the toilet from the main restroom area. Assistance would be required to cross this threshold and reach the toilet. Courses usually run from 10am until 3 or 4pm so this could be a definite barrier. Wheelchair assistance and accompaniment can be arranged through Morocco Accessible Travel Consultants if desired. If you are interested in a accessible cooking experience, contact us for details! This is an excellent option for travelers staying in Marrakech! This excursion is approximately 5-6 hours long. Time includes driving, souk tour, cooking class and lunch before returning to your hotel or riad. Contact Us to Start Booking Now!